On day 1, we learnt how lambdas can help us write clean concise code by allowing us to pass behavior without the need to create a class. Lambdas is a very simple language construct that helps developer express their intent on the fly by using functional interfaces. The real power of lambdas can be experienced when an API is designed keeping lambdas in mind i.e. a fluent API that makes use of Functional interfaces(we discussed them on day 1). One such API that makes heavy use of lambdas is Stream API introduced in JDK 8. Streams provide a higher level abstraction to express computations on Java collections in a declarative way similar to how SQL helps you declaratively query data in the database. Declarative means developers write what they want to do rather than how it should be done. Almost every Java developer has used Collection API for storing, accessing, and manipulating data. Collection API does not provide higher level abstraction to query the data so developers are forced to write a lot of boilerplate code for the most trivial task. Suppose, you have a list of numbers and you want to filter out all the even numbers so, prior to Java 8 you would write a code like the one shown below. To perform such a simple task we wrote 7 lines of Java code. The bigger problem with the above mentioned code is not the number of lines a developer has to write but, it misses the developer’s intent i.e. filtering the even numbers. The above mentioned code can be simplified using Java 8 streams as shown below. The line numbers.stream().filter(number -> number % 2 == 0).collect(Collectors.toList()) constructs a stream pipeline composing of multiple stream operations as discussed below. stream() – You created a stream pipeline by invoking the stream() method on the source i.e. numbers List. filter() – It is an intermediate stream operation which extract elements in the stream matching the condition defined by the predicate. Once you have a stream you can call zero or more intermediate operations on it. The lambda expression number -> number % 2 == 0 defines a predicate to filter all even numbers in the Stream. The type of lambda expression is java.util.function.Predicate. collect(toList()) – It is the terminal operation that collects the result of the operations performed on the Stream to a List i.e. all the even numbers in the numbers List are collected into a new List. Stream API provides a lot of operations that developers can use to query data from collections. Stream operations fall into either of the two categories — intermediate operation or terminal operation. Intermediate operations are functions that produce another stream from the existing stream like filter, map, sorted, etc. Terminal operations are functions that produce a non-stream result from the Stream like collect(toList()) , forEach, count etc. Intermediate operations allows you to build the pipeline which gets executed when you call the terminal operation. Below is the list of functions that are part of the Stream API. The difference between Java 8 Stream API code and Collection API code shown above is who controls the iteration, the iterator or the client that uses the iterator. Users of the Stream API just provide the operations they want to apply, and iterator applies those operations to every element in the underlying Collection. When iterating over the underlying collection is handled by the iterator itself, it is called internal iteration. On the other hand, when iteration is handled by the client then it is called external iteration. The use of for-each construct in the Collection API code is an example of external iteration. Some might argue that in the Collection API code we didn’t have to work with the underlying iterator as the for-each construct took care of that but, for-each is nothing more than syntactic sugar over manual iteration using the iterator API. The for-each construct although very simple has few disadvantages — 1) It is inherently sequential 2) It leads to imperative code 3) It is difficult to parallelize. When we work with Collection API, every operation that we perform is eagerly evaluated. Look at the example code shown below. The code shown above finds all the reading tasks sorted by their creation date. If you look at the code closely you will see that this code does three things — 1) Filter all reading tasks 2) Sort all filtered tasks by creation date 3) Collect all the titles in a list. These three stages are eagerly evaluated and we had to create temporary variables like readingTasks to store the intermediate values. In Java 8, we can write the above mentioned code as shown below. filter(task -> task.getType() == TaskType.READING). The code shown above does the same work but, the user is not concerned about the iteration and creating temporary variables for storing intermediate results. 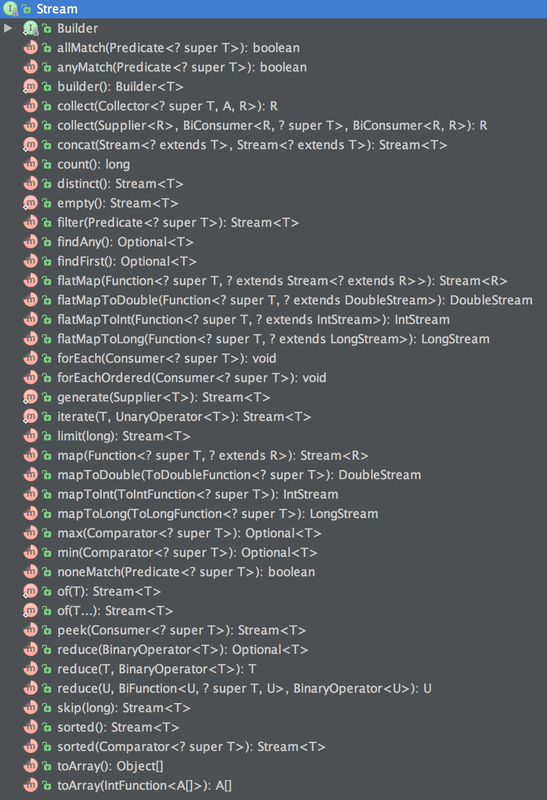 Java 8 lazily evaluates the stream pipeline when terminal operation(collect(toList())) is called. We will not worry about Stream API methods like map, filter, sorted for now as they will be covered later in the blog. To make sure you understand the lazy evaluation concept, let’s look at another example as shown below. As you can see in the code above, we are dividing by 0 so it will throw ArithmeticException when the code is executed. But, when you run the code no exception is thrown. This is because streams are not evaluated until a terminal operation is called on the stream. If you add terminal operation to the stream pipeline, then stream is executed, and exception is thrown. You will get stack trace as shown below. Throughout the series we will use Task management domain to explain the concepts. Our example domain has one class called Task — a task to be performed by user. The class is shown below. The sample dataset is given below. We will use this list throughout our Stream API examples. We will not discuss about Java 8 Date Time API today. For now, just think of as the fluent API to work with dates. Filter all the tasks that have TaskType as READING. Sort the filtered values tasks by createdOn field. Get the value of title for each task. Collect the resulting titles in a List. The following four operations can be easily translated to the code as shown below. filter: Allows you to specify a predicate to exclude some elements from the underlying stream. The predicate task -> task.getType() == TaskType.READING selects all the tasks whose TaskType is READING. sorted: Allows you to specify a Comparator that will sort the stream. In this case, you sorted based on the creation date. The lambda expression (t1, t2) -> t1.getCreatedOn().compareTo(t2.getCreatedOn()) provides implementation of the compare method of Comparator functional interface. map: It takes a lambda that implements Function which transforms one stream to another stream. The lambda expression task -> task.getTitle() transforms a task into a title. collect(toList()) It is a terminal operation that collects the resulting reading titles into a List. We can improve the above Java 8 code by using comparing method of Comparator interface and method references as shown below. From Java 8, interfaces can have method implementations in the form of static and default methods. We will cover them later in this series. In the code shown above, we used a static helper method comparing available in the Comparator interface which accepts a Function that extracts a Comparable key, and returns a Comparator that compares by that key. The method reference Task::getCreatedOn resolves to Function. Using function composition, we can very easily write code that reverses the sorting order by calling reversed() method on Comparator as shown below. Suppose, we have a dataset which contains duplicate tasks. We can very easily remove the duplicates and get only distinct elements by using the distinct method on the stream as shown below. The distinct() method converts one stream into another without duplicates. It uses the Object’s equals method for determining the object equality. According to Object’s equal method contract, when two objects are equal, they are considered duplicates and will be removed from the resulting stream. The limit function can be used to limit the result set to a given size. limit is a short circuiting operation which means it does not evaluate all the elements to find the result. You can use limit along with skip method to create pagination as shown below. // page starts from 0. So to view a second page `page` will be 1 and n will be 5. To get the count of all the reading tasks, we can use count method on the stream. This method is a terminal operation. Extract tags for each task. Collect all the tags into one stream. Finally collect the result into a list. The first and second operations can be performed by using the flatMap operation on the tasks stream. The flatMap operation flattens the streams returned by each invocation of tasks.getTags().stream() into one stream. Once we have all the tags in one stream, we just used distinct method on it to get all unique tags. Stream API has methods that allows the users to check if elements in the dataset match a given property. These methods are allMatch, anyMatch, noneMatch, findFirst, and findAny. To check if all reading titles have a tag with name books we can write code as shown below. To check whether any reading task has a java8 tag, then we can use anyMatch operation as shown below. Suppose, you want to create a summary of all the titles then you can use reduce operation, which reduces the stream to a value. The reduce function takes a lambda which joins elements of the stream. reduce((first, second) -> first + " *** " + second). Another example of reduce operation is when you have to find the product of squares of all numbers from given a list of numbers. This is a second variant of reduce which takes two values — 1) An initial value like 1 in this case 2) A BinaryOperator that combines two elements to produce a new value. Apart from the generic stream that works over objects, Java 8 also provides specific streams that work over primitive types like int, long, and double. Let’s look at few examples of primitive streams. To create a range of values, we can use range method that creates a stream with value starting from 0 and ending at 9. It excludes 10. The rangeClosed method allows you to create streams that includes the upper bound as well. So, the below mentioned stream will start at 1 and end at 10. You can also create infinite streams using iterate method on the primitive streams as shown below. To filter out all even numbers in an infinite stream, we can write code as shown below. We can limit the resulting stream by using the limit operation as shown below. You can create streams from arrays by using the static stream method on the Arrays class as shown below. You can also create a stream from the array by specifying the start and end indexes as shown below. Here, starting index is inclusive and ending index is exclusive. One advantage that you get by using Stream abstraction is that now library can effectively manage parallelism as iteration is internal. So, to process a stream in parallel it is as easy as shown below. In this blog, we learned how to work with Streams API introduced in Java 8 with the help of examples. On day 3 we will look at Collectors. Stay tuned!! This entry was posted in 7-days-with-java8, java and tagged java, java8, streams on July 26, 2015 by shekhargulati.